I wanted a small portable gas forge that I could use for small forging jobs that did not require the use of a large forge. 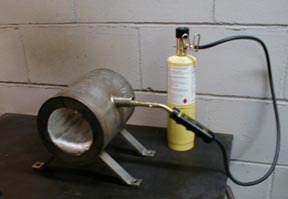 When I first started building it, I wanted to make it run using a hand held propane torch, but I could not get a good heat using the propane. So I tried using Mapp gas, and I was able to heat the test piece to 1950 degrees. I used Tempil sticks to verify the temperature of the test piece. I tried several different torch outfits and settled on using a Bernz O Matic model # JTH7. 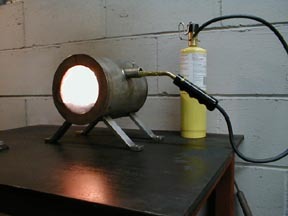 It seems to produce the best heat and has the added flexibility of the separate torch wand. This picture is of the torch wand removed from the forge. I got the torch outfit at Home Depot for less than $30.00. The forge body is a piece of 6" schedule 10 pipe 8" long. I welded a plate on the backside of the pipe to close it off. The pipe in the side of the forge body that holds the torch wand is 3/4" pipe that has a hole tapped in the top for a thumb screw. The forge liner is 1" 8# Fiberfrax ceramic blanket. Update: April 12, 2005 Doug Marx recently sent me a picture of his new mini forge along with a description of how he built it. He built the forge using the basic mini forge design from this web page, he used a 6" weld cap, 6" x 4" weld pipe reducer, and a short piece of six inch pipe. This is a great looking little forge. Update November 15, 2008: Bernz O Matic is phasing out the model # JTH7 torch set and replacing it with the BZ 8250 Trigger-Start Hose Torch. This torch outfit features a 5ft. 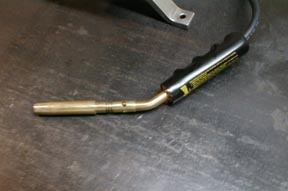 hose, instant on/off trigger ignite and a Stainless Steel burner tube. The Stainless steel burner tube is a great improvement over the old burner tube made out of brass because I melted one while I was not paying attention to the mini forge that was running out of gas. I bought one of the torch sets today and the price was $ 64.00 for the set, that is a lot more than I paid for the JTH7 set but I feel that it is well worth it for the updated features. 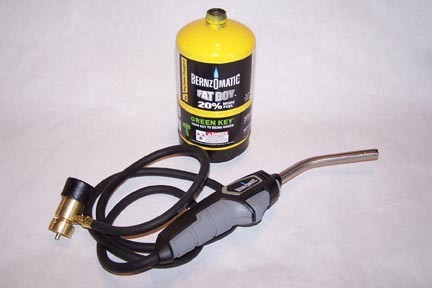 Bernzomatic is also discontinuing the Mapp gas bottles and replacing it with Propylene gas bottles. The Mapp gas open air flame was 3750º F and the Propylene open air flame is 3730º F, so there is not much difference in temperature output. The old 14.1 ounce tall bottles are also being replaced with a shorter and fatter bottle that holds 16.92 ounces per bottle; these bottles are called Fat Boys. 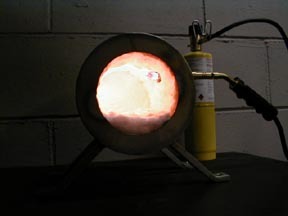 Update November 28, 2008: Today I installed the BZ 8250 torch outfit with Propylene gas in a coffee can forge and the forge temperature after 15 minutes was 2050 º F .
The picture above is of the BZ 8250 torch. Update: January 28, 2013: Sometime in 2008 Mapp gas was discontinued and was replaced with Mapp Pro gas, the advertised open air flame temperature of Mapp gas was 3750 degrees Fahrenheit and the advertised open air flame temperature of Mapp Pro is 3730 degrees Fahrenheit. The open air flame temperature for Propane gas is 3600 degrees Fahrenheit so is the extra 130 degrees that the Mapp Pro puts out worth the extra money you have to pay for the Mapp Pro gas. While doing research on this subject there seams to be a lot of different open air flame temperatures listed for all of the gases that I have talked about, the ones that I used here seam to be the most consistent that I found.